This trip began taking shape almost a year ago when good friend, Simon Bennett, was planning to run a railtour in the US. Frustrated with too many barriers being put in his way he put the plans on hold and invited a few of us to come over for a rail-based holiday on the north-east coast of America. I'm not sure what Simon expected the take-up to be but twelve of us said "yes"! Full credit to Simon as he thrashed out a 6-day itinerary taking in a fair mix of local and long distance services, based around a 5-day Amtrak North-East railpass. Hotels and flights were all booked in late 2003 - the Birmingham contingent (organised by my good self) getting the bargain airfare - £200 for the Continental Airlines direct flights to Newark, New Jersey and back. The others travelling from Gatwick (nine-foot Neil) and Manchester (all except Bob who would join us from Canada where he is currently based) all paying nearer £300 for their flights. Knowing very little about US rail traction I was still very much looking forward to the trip as I'd heard good things from others who have been before. Obviously there was some concern how such a large group of us might be perceived and treated as we headed round the rail system complete with cameras and video recorders but we really needn't have worried as, almost without exception, all the rail staff we encountered throughout the holiday were extremely friendly and accommodating. So, here we go then....the review is split into a Page for each day. A full photographic selection will follow in due course (using a Fotopic Website), but in the mean time there's one below just to be going on with and various others scattered in the review Pages. 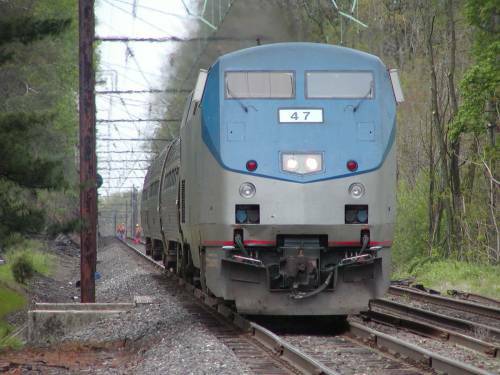 Amtrak GE Dash9 P42B no. 47 approaches Elizabethtown on 3rd May. All winning traction is shown thus. More information on the US can be found on the USA by Rail Website, maintained by Simon Bennett.